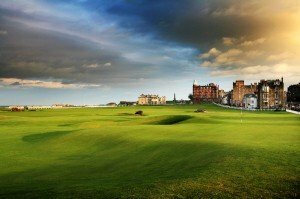 The Old Course in St Andrews is so popular and demand from all over the world so great, that the traditional way to allocate playing places has been through the existing daily ballot, which is heavily oversubscribed. This means that many people have to wait for years to get on, and if they are in a group, they may not get to play with their intended partners. Golf Vacations UK offer prime guaranteed tee times with accommodations within St Andrews with prime slots in the morning and afternoon, allowing you to make bookings in advance with the security of start times and playing with one’s friends or colleagues. Golf Vacations UK Guarantees Tee Times on the Old Course at St Andrews. This tour features 4 of the Open Championship Courses in Scotland and many other classic courses chosen for their outstanding quality. Arrive in Glasgow and collect the Hire Car of your choice. Coach and driver are also available should you prefer an escorted tour. You will then make the short journey to Turnberry where you will stay in the Turnberry Hotel for the next two nights. Breakfast is included throughout your stay. Play 1 round at Turnberry Ailsa Open Championship Course. Today, after breakfast, you will leave the delights of the Turnberry Hotel and travel the short distance to Troon, where you will play Royal Troon Open Championship course. If you wish you may then play the Portland course before making your way to The Gleneagles Hotel (The Palace of the Glens) for your overnight stay. Play today on Gleneagles Kings Course or Gleneagles PGA Centenary Course, which is the venue for the 2014 ryder Cup. After your round travel to the Highlands where you will have a choice of various hotels for the next two nights. Play 1 round at ‘The Star of The North’ Royal Dornoch. Play 1 round at your choice of Nairn West Championship course or the Scottish Open Championship Course at Castle Stuart. Play 1 round at either Royal Aberdeen or Cruden Bay, whichever you have chosen on your itinerary. After your golf make the short journey to St.Andrews where you will stay in one of a choice of hotels for the next 3 nights. Today is the highlight of any golfers dream. This is the day you will play The Old Course at St. Andrews. Room upgrades available at most hotels. Self Drive or Fully Escorted Tour. Accommodation inclusive of full Scottish breakfast at all hotels. Land Transport – Rental Car appropriate to the size of the group, inclusive of CDW, Theft Waiver and unlimited mileage or Escorted Tours by executive coach with dedicated driver. Various sizes of coach available. All other service charges and local taxes. Although this tour is shown as starting on a Saturday, the itinerary is flexible and can be adjusted to your requirements. This tour is not set in stone and can be mixed or matched with any other tours or golf courses required.